Thomas Carlyle, Scottish historian, critic, and sociological writer. was born in the village of Ecclefechan, Dumfriesshire, eldest child of James Carlyle, stonemason, and Margaret (Aitken) Carlyle. The father was stern, irascible, a puritan of the puritans, but withal a man of rigid probity and strength of character. The mother, too, was of the Scottish earth, and Thomas' education was begun at home by both the parents. From the age of five to nine he was at the village school; from nine to fourteen at Annan Grammar School. where he showed proficiency in mathematics and was well grounded in French and Latin. In November 1809 he walked to Edinburgh, and attended courses at the University till 1814, with the ultimate aim of becoming a minister. He left without a degree, became a mathematical tutor at Annan Academy in 1814, and three years later abandoned all thoughts of entering the Kirk, having reached a theological position incompatible with its teachings. He had begun to learn German in Edinburgh, and had done much independent reading outside the regular curriculum. Late in 1816 he moved to a school in Kirkcaldy, where he became the intimate associate of Edward Irving, an old boy of Annan School, and now also a schoolmaster. This contact was Carlyle's first experience of true intellectual companionship, and the two men became lifelong friends. He remained there two years, was attracted by Margaret Gordon, a lady of good family (whose friends vetoed an engagement), and in October 1818 gave up schoolmastering and went to Edinburgh, where he took mathematical pupils and made some show of reading law. During this period in the Scottish capital he began to suffer agonies from a gastric complaint which continued to torment him all his life, and may well have played a large part in shaping the rugged, rude fabric of his philosophy. In literature he had at first little success, a series of articles for the Edinburgh Encyclopaedia bringing in little money and no special credit. In 1820 and 1821 he visited Irving in Glasgow and made long stays at his father's new farm, Mainhill; and in June 1821, in Leith Walk, Edinburgh, he experienced a striking spiritual rebirth which is related in Sartor Resartus. Put briefly and prosaically, it consisted in a sudden clearing away of doubts as to the beneficent organization of the universe; a semi-mystical conviction that he was free to think and work, and that honest effort and striving would not be thwarted by what he called the "Everlasting No." For about a year, from the spring of 1823, Carlyle was tutor to Charles and Arthur Buller, young men of substance, first in Edinburgh and later at Dunkeld. Now likewise appeared the first fruits of his deep studies in German, the Life of Schiller, which was published serially in the London Magazine in 1823-24 and issued as a separate volume in 1825. A second garner from the same field was his version of Goethe's Wilhelm Meister which earned the praise of Blackwood's and was at once recognized as a very masterly rendering. In 1821 Irving had gone to London, and in June 1821 Carlyle followed, in the train of his employers, the Bullers. But he soon resigned his tutorship, and, after a few weeks at Birmingham, trying a dyspepsia cure, he lived with Irving at Pentonville, London, and paid a short visit to Paris. March 1825 saw him back; in Scotland, on his brother's farm, Hoddam Hill, near the Solway. Here for a year he worked hard at German translations, perhaps more serenely than before or after and free from that noise which was always a curse to his sensitive ear and which later caused him to build a sound-proof room in his Chelsea home. Before leaving for London Irving had introduced Carlyle to Jane Baillie Welsh daughter of the surgeon, John Welsh, and descended from John Knox. She was beautiful, precociously learned, talented, and a brilliant mistress of cynical satire. Among her numerous suitors, the rough, uncouth Carlyle at first made an ill impression; but a literary correspondence was begun, and on October 17, 1826, after a courtship that was in some sort a battle of strong wills, the two were married and went to live at Comely Bank, Edinburgh starting with a capital of £200. Francis Jeffrey, editor of the Edinburgh Review, was a cousin of the Welshes. He accepted Carlyle as a contributor, and during 1827 printed two important articles — on "Richter" and "The State of German Literature." The Foreign Review published two penetrating essays on Goethe; and in 1827 a cordial correspondence was begun with the great German writer, who backed Carlyle (unsuccessfully) for the vacant Chair of Moral Philosophy at St. Andrews. Another application for a university chair, this time at the new University of London, failed equally. An attempt at a novel was destroyed. In May 1828 the Carlyles moved to Craigenputtock, an isolated farm belonging to the Welsh family, which was their permanent home until 1834. Carlyle lived the life of a recluse and scholar, and his clever wife, immersed in household duties and immured in solitude, led a dull and empty existence. Jeffrey, who paid visits in 1828 and 1830, said: "Bring your blooming Eve out of your blasted Paradise, and seek shelter in the lower world," but Carlyle was lacking in consideration for his partner, and would not. Jeffrey even thought of Carlyle as his successor in the editorship of the Edinburgh, when he gave it up in 1829, but the matter could not be arranged. A memorable visit, in August 1833, was that of the young Ralph Waldo Emerson, who was kindly received and became a fast friend. At Craigenputtock was written the first of Carlyle's great commentaries on life in general, Sartor Resartus, which appeared in Fraser's Magazine between November 1833 and August 1834. The idea of a philosophy of clothes was not new; there are debts to Swift, Jean Paul Richter, and others; but what were new were the amazing, humorous energy, the moral force, the resourceful (if eccentric) command over English. It was damned by the press, and was not issued in book-form until 1838; but it is now numbered among his most significant works. Other notable writings of this time were essays on Voltaire, Novalis, and Richter (a new paper) in the Foreign Review. After visits to Edinburgh and London, and an unsuccessful application for a professorship of astronomy at Edinburgh in January 1834, Carlyle decided to set up house in London, settling at 5, Cheyne Row, Chelsea. His struggle to live was made more severe by his refusal to engage in journalism: even an offer of work on The Times was rejected; and instead a grandiose history of the French Revolution was begun. In the spring of 1835 occurred one of the great heroisms of literature. The manuscript of the first volume of the new work had been lent to the philosopher, J. S. Mill, who in his turn had lent it to a Mrs. Taylor. An illiterate housekeeper took it for waste paper, and it was burnt. Mill was inconsolable; Carlyle behaved with the utmost stoicism and nobility, and was only with difficulty induced to accept £ 100 as a slight pecuniary compensation. The French Revolution was re-written, and its publication in January 1837 brought the praise of Thackeray, Southey, Hallam, and others of weight, and consolidated Carlyle's reputation as one of the foremost men of letters of the day. Even so, it sold slowly, and he had to resort to public lecturing (arranged by Harriet Martineau) to raise funds; and it was only in 1842, when Mrs. Welsh died and left them an annuity, that the Carlyles were able to rid themselves of financial worry. Of outward event Carlyle's life contains little. From his establishment in London his history was one of enormous work and the gradual building up of a literary fame that became world-wide. In the 'forties and onward he became more and more sought after by men of letters, statesmen and the aristocracy, and his friends included such names as Monckton Milnes, Tyndall, Peel, Froude, Grote, Browning, and Ruskin. One friendship, with the clergyman, John Sterling, was close and warm, and left its record in the Life published in 1851. Another, with Lady Harriet Ashburton, caused grave dissension in the Carlyle home, being strongly disapproved by Mrs. Carlyle, though there was no suggestion of anything more than high mutual regard. Arrangement in Grey and Black, No. 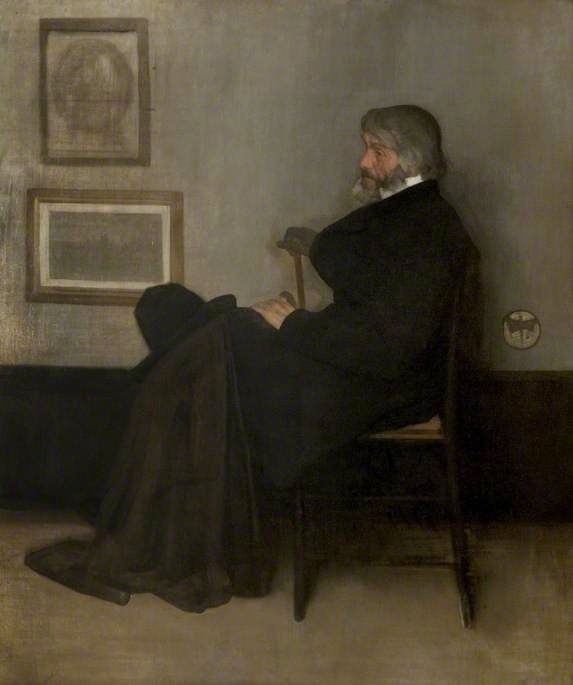 2: Portrait of Carlyle James Abbot McNeill Whistler (1834–1903). 1872-73. Oil on canvas, 171 x 143.5 cm. Collection: Kelvingrove Art Gallery and Museum in Glasgow, Scotland. 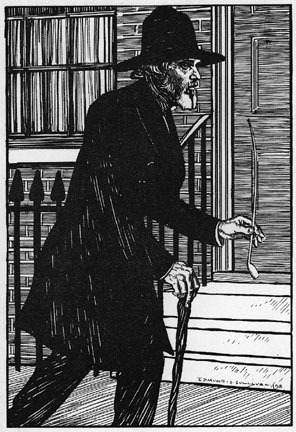 In literature Carlyle moved more and more away from democratic ideas. Chartism, On Heroes Past and Present, and Cromwell all developed his thesis that the people need a strong and ruthless ruler and should obey him. Latter-day Pamphlets, which includes "Hudson's Statue," poured out all his contempt on the philanthropic and humanitarian tendencies of the day. His last monumental exaltation of strength was a six-volume history of Friedrich II of Prussia: Called Fredrick the Great. Following his custom, he paid two visits to Germany to survey the scene (in 1852 and 1858), and turned over great masses of material. The first two volumes appeared in the autumn of 1858, were at once translated into German, and were hailed as a masterpiece. The remaining volumes appeared in 1862, 1864, and 1865. In this last year Carlyle was made Lord Rector of the University of Edinburgh. While he was still in the north, after delivering his inaugural address, he learned of the sudden death of his wife, from heart disease, and was thereby plunged into the deepest distress. Thenceforward a gradual decadence supervened. 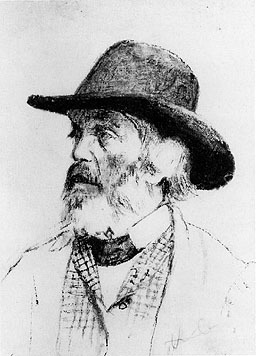 In the autumn of 1866 Carlyle joined the committee for the defense of Governor Eyre, of Jamaica, who had been recalled for alleged cruelty in the suppression of a rebellion. The next year he wrote the tract, Shooting Niagara, against the Reform Act (which had introduced improvements into the British franchise system). He sided with the Prussians in the war of 1870-71; in 1874 he was awarded the high Prussian order "Pour le Merite," and the same year refused Disraeli's offer of a Grand Cross of the Order of the Bath and a pension. He died on February 4, 1881, and was buried at Ecclefechan. Carlyle's personal character and his philosophy are alike full of contradictions and hardly susceptible to summary exposition. The most high-minded devotee of the ideal, he could yet be in the last degree churlish and uncharitable to the work and personalities of others — even to such a man as Charles Lamb. An apostle of courage and endurance, he was yet the most vociferous and ungracious of grumblers. His love for his wife was deep and abiding, yet her life with him was often a torment. While he abhorred philanthropy and liberal legislation along utilitarian lines, and came more and more to admire despotism, he could be scathing about the "game-preserving aristocracy" and in his personal life was quick to relieve distress. No coherent body of philosophy can be extracted from his teachings: it is rather as a prophet and a seer that he has his place. He was blind to the greatest phenomenon of his age — the rise of science as an interpreter of the universe — and spoke insultingly of Darwin. Formal economics also incurred his censure. His theological attitude is hardest of all to define. At an early age he found himself unable to subscribe to any of the orthodox creeds, but he was even more condemnatory of atheism than of the Kirk, and never ceased to believe passionately in a personal God. His central tenet was the worship of strength; and, after beginning as a radical, he came to despise the democratic system and increasingly to extol the value and necessity of strong and stern government, in which the people themselves should have no share. In literature he was the pioneer who explored and made known the work of modern Germany. His literary judgments were penetrating, and (when he had a congenial subject) just; and on men like Voltaire, Burns, and Johnson he gave verdicts that approached finality. As a historian he is in the highest rank. Barring certain unimportant errors of detail, he illumined the past with astonishing insight and made his personages actual and his scenes dramatic. His style is an extraordinary farrago, leaping not flowing, coining strange words and performing extravagant evolutions; yet cumulatively it impresses as a great style, suffused with humor, irony, and passion; impossible to imitate, utterly personal, burning, and convincing. "Carlyle's genius," wrote Hector Macpherson, "was many-sided. He touched and ennobled the national life at all points. He lifted a whole generation of young men out of the stagnating atmosphere of materialism and dead orthodoxy into the region of the ideal. With the Master of Balliol, we believe that 'no English writer has done more to elevate and purify our ideas of life and to make us conscious that the things of the spirit are real, and that in the last resort there is no other reality.'"